← Rawhide Chewies – a Big No-No! Nothin’ Says Lovin’….. like homemade Bread! Yes, we eat bread. Can’t not eat it, that’s all there is to it. So, we make our bread with a bread machine, weekly. 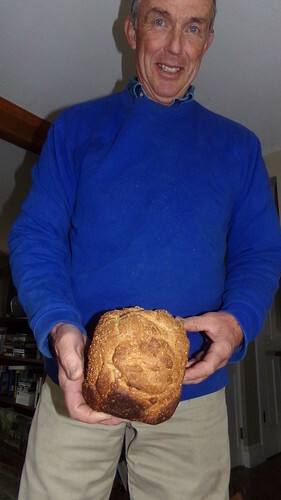 Paul gets his made every 4 days – using Bob’s Red Mill 10-grain Bread Mix… see below for today’s loaf. Wow, a perfect loaf. This is because I changed the procedure a bit. With the bread machine we use, you put in your ingredients (with the mix, we just add 3 TBSP of oil, 10 oz. of warm water, and the mix and yeast) and press “start” and it goes for 3:15 in total. During this time period, there are various “beeps” – one to indicate “now is the time to add nuts or other things” – and the next one happens with about 1:50 left on the timer and that is the time to take out the paddle in the bottom of the pan. If you don’t remove the paddle then, you will have to remove it from the baked loaf, and it will leave a hole in the bread. So up until today, I’ve been removing the paddle when it beeps at 1:50 and then leaving it in there til it’s all baked. Even with the paddle removed, though, you still get a small hole in the bread from the post where the paddle was. But there is another way, which I did today. When it was time to remove the paddle, I took the whole thing out, sprayed a glass bread pan with Pam, and put the dough into it, with a towel over it, for the last “rise.” I timed it so that it would sit there for about 43 more minutes and then I would heat up the oven (350 F) and pop it in for the last 45 minutes of the baking time. It worked perfectly. The paddle was removed when the bread came out of the machine pan… and the hole where the paddle had been was pinched over with my hands using the dough. 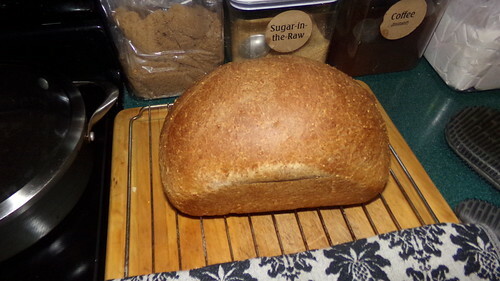 Now Paul has a regular looking loaf of 10-grain bread, and I can hardly wait to show him! It takes a bit more attention to detail, but heck, I’m home all day so why not? 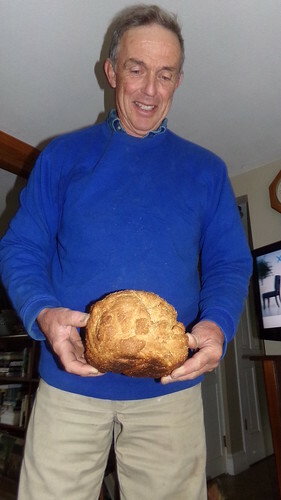 Here you can see a loaf Paul made… I have no idea what happened but each time he tries it, it’s less than perfect! 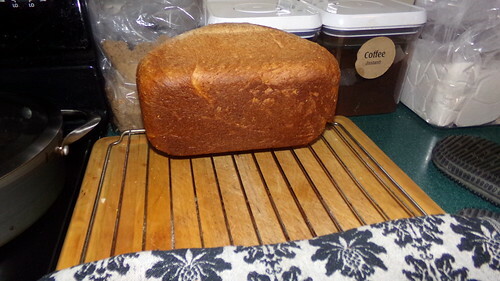 7 Responses to Nothin’ Says Lovin’….. like homemade Bread! Yes, Teri, I love the Krusteaz breads. They have a 4-package selection of 4 different sourdough breads that I’ve ordered, too. Will report back on them when they are made. The Krusteaz is actually a good sour dough mix, huh Bex? I know I’ve seen those somewhere. DH and I will have to look because I LOVE sour dough bread! Teri, yes, take the paddle out… mine beeps at about 1:50 left on the timer to take out the paddle but there’s still a hole. Instead, try my technique. No Hole! And Paul got a full 2 extra slices out of this loaf – they are shorter but it’s a longer loaf being baked in a bread pan/dish. Anna! I have been making sourdough breads for myself and love them, from a mix. Sourdough has the enzymes in it (probiotics) and since I’ve been taking probiotics, I’ve been going with the sourdough… not so advanced yet as to make my own though… here are the mixes I use. Sandy – nice of you to give him the machine. 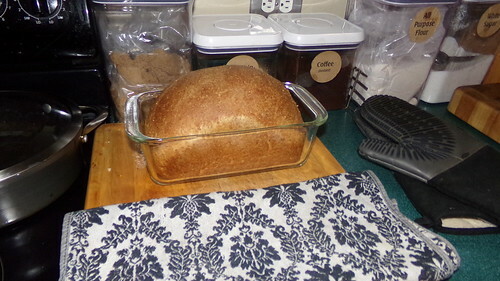 Sandy/Chicago – yes, the house does smell great whenever I made a loaf! Wow your loaf looks better than what they sell in those gourmet catalogs I get at Christmas! I bet the house smells great too!